The recent biopic The Race reminds us of Jesse Owens’ amazing feat in winning a then-record four track gold medals at the 1936 Berlin Olympics. The movie accurately frames Owens’ (Stephan James) victories as a rebuke to the Nazi propaganda machine, which was trying to use the games to promote the myth of white supremacy. Claims of an Aryan master race were quickly dashed by the actual 100-meter, 200-meter and 4x100 races, and the long jump, all won by Owens. African-American men also won the high jump, the 400-meter and the 800-meter titles at the Berlin Games. Hitler, famously, did not personally and publicly congratulate Owens, but this snub applied to all of the Olympic champions at the Berlin Games after the second day of competition, regardless of race or nationality. Owens, a staunch Republican, would later note that he was also snubbed by America’s own head of state; Democratic President Franklin Roosevelt did not welcome him to the White House after his Berlin triumph. It is largely forgotten that on the games’ opening day, the Nazi leader did invite the winning medalists of each of the first three events to his personal box, where he was seen congratulating them. But Hitler pointedly left the stadium immediately before the award ceremony for the day’s final event, the high jump, where all three medalists were American. Cornelius Johnson of Compton (Calif.) Junior College became the first black athlete to win a gold medal in Berlin. Silver went to Dave Albritton, an Ohio State Buckeye and roommate of Jesse Owens who was also African American. Delos Thurber, of the University of Southern California, who was white, won the bronze. Hitler’s blatant rebuff of the American athletes angered the president of the International Olympic Committee, who demanded the chancellor either congratulate all winners from all nations or none. Hitler chose the second option. But even less well-known and very rarely seen is the astonishing—especially to 21st-century eyes—protest by Johnson and his fellow medalists in response to this snub. The high jumpers’ protest is certainly not as well known as Tommie Smith’s and John Carlos’ black power salute at the Mexico City Olympics in 1968, but its nature and meaning requires a little background and context. Cornelius Cooper Johnson was born in Los Angeles in August 1913. By the time he entered Los Angeles High School, Corny Johnson was already one of the best high jumpers in California, but he shocked the world of track and field in 1932, while still a junior, by tying for first place at the 1932 U.S. Olympic trials. He then won a jump-off. The Olympics were held in his home city, and Johnson, age 18, was one of only four African-American athletes on the U.S. men’s team. Despite his youth and inexperience, Johnson finished in a four-way tie for first place, clearing 6 feet 5 1⁄2 inches. A jump-off to determine gold, silver and bronze left Johnson in fourth place. Although both the gold and silver high jump medalists in the 1932 games had attended the nearby University of Southern California, Johnson was not invited to attend USC. The Trojans track team was at that time defiantly lily-white. Instead he matriculated at the much-less-fancied Compton Junior College, winning the national outdoor Amateur Athletic Union high jump title in his freshman year. In 1936, at the trials for the Berlin Olympics, Johnson became the first African-American high jumper to set a world record, clearing 6 feet 9 3⁄4 inches. Johnson was still being interviewed on the radio about his great jump when Albritton matched the same mark a few minutes later. A New York Times sports reporter, Arthur Daley, confidently predicted that the “lanky” Johnson, “one of the greatest jumpers of all time” and unbeaten since the 1932 Olympics, was the favorite for gold. In Berlin, the high jump was scheduled for Aug. 2, the first day of track and field competition at the Olympic Stadium. Reports of the games suggest that most of the 100,000 crowd, including Hitler in his box, paid most attention to the victories by the host nation in the women’s javelin and the men’s shot put, and by Finland’s 1, 2, 3 in the 10,000 meters. Hitler could be seen to be clearly delighted by such “Aryan” victories—the Finns were even blonder and more blue-eyed than the Germans. Only the rousing cheers from the crowd as Jesse Owens won his 100-meter heat appeared to disturb Hitler’s buoyant mood as the day’s events drew to a close. By 6 p.m., the high jump field of 40 had been reduced to four. The three Americans and a Finn all cleared a new Olympic record of 6.5 feet. German director Leni Riefenstahl’s film of the games shows the long-limbed Johnson limbering up for his final jumps, looking relaxed. Albritton needed three attempts to make 2 meters. Corny Johnson made every one of his jumps with ease. Unlike Albritton, who confessed his nerves to his friend Jesse Owens, Johnson was, as usual, calm and focused. Johnson went on to set a new Olympic record height of 6 feet 8 inches. Albritton earned the silver and Thurber the bronze. Following the medal ceremonies in the men’s shot put and 10,000 meters and the women’s javelin, Hitler had invited the German and Finnish medalists to be feted at his private box, where he was seen openly congratulating them. American journalists in the stadium then began to wonder if Hitler would welcome Corny Johnson, at least, as he had the previous winners just minutes earlier. Their answer came quickly after the medal ceremony at which the Stars and Stripes was raised on all three podiums: Hitler had left the building. There would be no glad-handing with the führer. What happened next is revealing. The U.S. Olympic Committee does not appear to have protested Hitler’s snub of the American athletes, but Count Henri de Baillet-Latour, the president of the International Olympic Committee, was incensed. The Belgian aristocrat saw Hitler’s early exit as a direct insult to the games’ lofty commitment to fair play as well as a violation of protocol. It is unclear whether the count viewed the matter in terms of race or as a snub to a member country, the USA, but he forthrightly demanded that Hitler either congratulate all medalists or none. Seeking to avoid a public relations nightmare, Hitler backed down. He agreed to stop welcoming any of the medalists into his box for the rest of the tournament. At the time, most American newspapers, except the New York Times and some of the black press, accepted the official Nazi explanation for Hitler’s early exit, namely that he was hungry and trying to beat the traffic. As they stood on the podium to receive their medals, Johnson, Albritton and Thurber would not have known any of this. But they would have been clearly aware from their position (and from the recent cheers) that Hitler had left and that they would not be received like the other champions. Unlike the earlier medal winners (and unlike Jesse Owens’ later victories), the full medal ceremony for the high jump is not recorded in the Riefenstahl documentary. 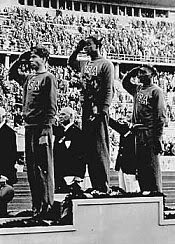 A single image can be found, which shows the three Americans on the podium saluting the U.S. flag with right-handed salutes. There is a second image, however, taken only seconds later, which appears only in the official record of the Olympic Games, and which has only recently entered the public domain. (A copy of the image can be seen at the bottom of page 26 here [pdf].) At first take, it appears that the three Americans are giving the straight-armed Nazi salute, but a closer look shows that their palms are facing upward and not down. No other athletes, from the U.S. or any other nation, can be seen giving that form of a salute in any of the recorded images of the 1936 Games. The three Americans were, in fact, giving the Bellamy salute, which in the 1920s and 1930s accompanied the Pledge of Allegiance, written by Francis Bellamy. The U.S. ended the practice early in World War II given the clear similarities to the “Heil Hitler” Nazi salute. Perhaps the Germans believed the three Americans had meant it as a respectful homage, and so allowed it to stay in the official record. But it seems more likely that the three athletes came upon the Bellamy salute as a rebuke to Hitler’s rebuke of them, and followed the Bellamy instructions, extended their right arms “gracefully, palm upward, toward the flag … ” It was a conscious political act, affirming the solidarity of three high jumpers as Americans and as athletes. Following the Olympics, Johnson’s career petered out. He performed poorly in the 1937 and 1938 Amateur championships, and it is unlikely he would have qualified to defend his Olympic gold in Tokyo in 1940, but those games were canceled because of World War II. By then, Johnson was working as a letter carrier for the U.S. Post Office in Los Angeles. His outdoor world record lasted until 1941, and his Olympic record until 1952, six years after his death at sea while working as a baker with the U.S. Merchant Marine. An obituary in the New York Times notes that he was taken off his ship in a “frenzied condition,” but that there were “no signs of foul play.” It later emerged that he had died of pneumonia at age 32. 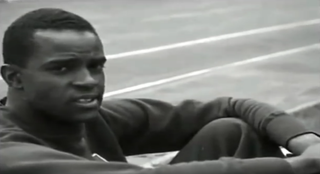 In 1994, Corny Johnson was inducted into National Track and Field Hall of Fame in Indianapolis, and his achievements as a world- and Olympic-record holder are indelibly marked in the record books. His dignified protest against Hitler’s clear discrimination at the 1936 Olympics, alongside Albritton and Thurber, deserves to be more widely known.